A new C-MAX Energi now costs about the same as the Tesla Models S battery upgrade which leads to the question, why are US taxpayer dollars being used to fund cars for millionaires. Ford has done something almost unthinkable until recently. It has now set the price of its plug in electric hybrid (PIH), which is capable of travelling fully 20 miles on electric power only, at $29,995.00. That price does include the federal tax credit and your locality may give you more of your neighbor’s money to buy this vehicle. The fact that what amounts to an electric car is now available at under $30K is so amazing it makes one wonder, why are the American taxpayers funding toy cars for millionaires and billionaires? 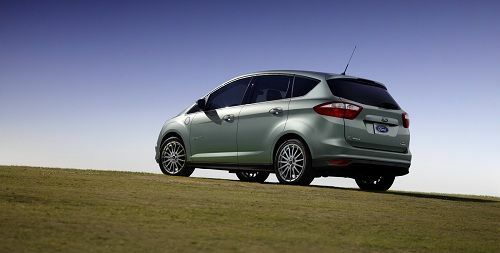 The Ford C-MAX Energi is Ford’s newest hybrid-only family car. About the size of the largest Prius, the Prius V, it can carry 5 passengers and it looks like a Mazda 5 or a small 1980s minivan. Its mini-minivan shape is ideal for shopping trips to Bed Bath and Beyond, or Best Buy. Unlike the Chevy Volt, which is only a 4 passenger compact car, this vehicle is very practical as a family car. Unlike the Nissan Leaf, which only has the ability to run on electricity, the Ford C-MAX Energi can also use its gasoline engine (which is of course a super-clean hybrid engine) to run up to 500 miles. That means you can use the C-MAX Energi as a fully electric vehicle if you have a normal commute to work, and then on weekends you can take it on vacations or to visit relatives and forget about the hassles of trying to figure out where and when your plug in your electric car. A Ford C-MAX Energi owner could drive 20 miles to work, plug their car in with an extension cord, work all day, then drive home on electricity. Or if their commute was only ten miles, they could do the trip both ways on electric power and then plug in at home and use the nighttime energy grid power which is plentiful, cheap, and does not stress the day-time grid. The Ford C-MAX Energi has a hybrid drivetrain that has battery capability able to carry the vehicle fully 20 miles. The car can be plugged in and charged up using your home electrical supply, so if the owner chooses to, they don’t need to burn gasoline to travel those 20 miles. Since the car is a hybrid, when it has used up its on-board electrical charge, the gasoline engine comes alive and the vehicle can travel a total of 550 miles with its gas tank full. Of course it can then be refueled and driven on. The EPA rates the C-MAX Energi at 95 miles to the gallon equivalent, about double the fuel economy of a standard Prius. The C-MAX Energi is also expected to be rated as an AT-PZEV vehicle which means its emissions are so low that it will qualify for the State of California’s coveted high-occupancy vehicle lanes sticker. This is a prize the California Air Resources Board reserves for only the cleanest cars on the road. Let’s face facts. People who buy cars costing between $50K and $100K are millionaires or richer. So why is it that American tax dollars are being wasted on Tesla, Fisker, and other makers of exotic toys for millionaires? The new Tesla Model S is a purely electric car. In addition to tax credits to people who buy these incredibly expensive cars, the American taxpayer leant nearly a half-billion dollars to Tesla to convert a factory (which used to make fuel sipping economy cars ironically). The standard battery pack is not impressive in the model S, so an upgrade is available. That upgrade to a larger battery costs about the same as the whole Ford C-MAX Energi! Clearly, there was a time when a case could be made that in order to advance the technology, the American taxpayer needed to fund Tesla and other Electric car makers so that we could get to a place where electric drive cars were available to the masses. Are we not there now? Isn’t a 20 mile commute at the outer limits of reasonable? Let’s not forget that electric cars have been around just as long as gasoline powered cars. GM had viable electric cars with 1970s technology in use for over a decade. Toyota, Nissan, Chevy, Ford, and other car makers all offer buyers a reasonably affordable way to drive around without using gas unless they choose to, or have to. In actual use all these automakers now offer drivers and consumers cost-effective electric transportation. Why are the American tax payers funding electric super-cars? American taxpayers are funding electric cars because (take your pick): A. They have no idea how their money is wasted by their representatives B. They are "on the take" receiving some benefit of that money, such as working for a car company or leveraging the subsidized price on products that they couldn't otherwise afford C. They are members of the religious cult of environmentalism D. They like waste, fraud and abuse, as demonstrated by centuries of tolerating it E. They have bought the argument that electric cars are "the future" and don't want to be seen as fuddy-duddies F. They think electricity grows on trees G. They want more mercury and lead in their drinking water; it improves the taste and prevents them from having to endure government health care by shortening their lives I could go on, but the options are endless. My particular choice is B. We've reached a point where more than half of Americans are milking the system for something, so they don't care if some people get their piece thru electric cars, free health care, cheap college tuition, whatever, so long as "they get theirs." The NUMMI plant that Tesla now owns was abandoned first when GM went bankrupt, then second by Toyota who couldn't afford to keep it open when GM bailed out. Because Tesla reopened the plant for car manufacturing, the company has been able to start rehiring the workers GM and Toyota laid off. The standard battery on the Model S is good for 160 miles, which is quite impressive compared to the other electric cars. But Tesla, being Tesla, goes for the no compromise electric car, and developed one with a 300 mile range.